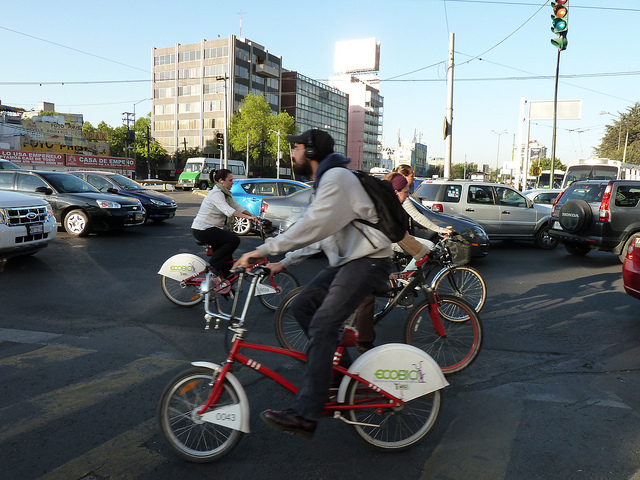 Mexico City’s bikeshare system, EcoBici, will add 3,000 more bikes in the months ahead. Photo by Dani Simons. Just weeks after London was preparing for a public transportation meltdown during the 2012 Summer Olympics, the second week of the 2012 Paralympics experienced heavy transit traffic with 215,000 spectators using public transport daily alongside the post-summer commuters and students that have returned for the school year. Lagos, a city famous for its hours long traffic jams, will expand its bus rapid transit (BRT) system to the Ikorudu neighborhood, adding 15 new stations and a dedicated bus lane running parallel to an existing roadway. The expanded system is forecast to carry 160,000 passengers daily. The Minister of Works and Transport for Namibia called for the development of intercity transport hubs in an effort to curb “piracy and illegal fares” that plague one of the world’s least densely populated countries. The U.S. Department of Transportation launched a pilot project in coordination with the University of Michigan Transportation Research Institute to install 3,000 “vehicle-to-vehicle” communications devices that will automatically signal to drivers when a road emergency becomes likely. Sydney’s new Long Term Transport Master Plan charts out the expansion of new BRT lines within the next 10 years and a revamp of its ferry system in the next five. The Chicago Transit Authority (CTA) integrated regional talent from Northwestern University in optimizing 50 city bus routes and eliminating 12 underused lines by sorting through transit data. The private operator of Jakarta’s BRT is facing sanctions for failing to pay its employees. The Jakarta Transportation council, which is levying the sanctions, is seeking to null its contract with PT Jakarta Express Trans, compounding pressure on the firm, which has in the past failed to compensate overtime pay to its employees for working on a national holiday. Vancouver’s widely successful urban car-sharing program, Modo, which has 275 vehicles, failed to catch on in outlying regions just beyond the city center, adding just six vehicles to the suburbs of Vancouver in recent months. The Mayor of Accra, Dr. Alfred Okoe Vanderpuije, this week announced progress of the city’s BRT system, which is reported to be 94 percent complete. The $95 million project is set to be completed by October. Mexico City will dramatically revamp its public bike sharing program and increase its system by 185 stations, sporting 3,000 more bikes in the coming weeks. Ecobici, the bikesharing program, will depart from its more mild station increase for 2011, which saw the addition of only 15 stations. High-tech firms are re-navigating en masse from the suburbs to walkable urban neighborhoods across the globe, from London’s Silicon Roundabout to Las Vegas’ old City Hall. Tech workers are no longer drawn to suburban office parks and are driving firms to relocate to urban, walkable spaces. The Obama Administration created new fuel economy standards set to double fuel efficiency in all new cars sold by 2025. Long Beach Transit, one of California’s largest transit agencies, will this week launch one of the America’s largest fleets of compressed natural gas (CNG) buses, adding 64 new units that will run on the considerably cheaper fuel. A commuter in the Washington D.C. area developed the “sensory shield,” a plastic device that provides additional privacy and mutes sensory stimulation while riding in a train or bus. The designer, Lisa Daly, is autistic and created the device to block out extra sensory stimulation that can have negative health impacts on those with the disorder. A Los Angeles company is attempting to prototype a fully electric heavy duty cargo truck that would have the endurance to transport goods over a long haul. Past attempts at electric trucks have resulted in batteries melting and vehicles catching fire, but improvements in technology provide hope for the vehicles, which are estimated to save $50,000 in fuel-related operating costs per year. Registration for the 92nd Annual Transportation Research Board Conference is now open. The event, held each January in Washington, D.C., brings together an international consortium of thousands of transportation industry professionals, think tanks, NGOs (including EMBARQ, the producer of this blog) and government agencies. The event will be held from January 13-17. Advanced registration is encouraged. In response to controversial political ads posted by a pro-Israeli group, Golden Gate Transit, a San Francisco Bay Area commuter bus service will be implementing a policy barring political or religious advertising on its vehicles. Due to controversy of the ads being placed on nearby transit agency San Francisco MTA’s buses and trains, SFMTA donated its ad revenues to the City’s Human Rights Commission, an organization that advocates for civil rights within the the City. Dubai-based marketing agency, Drumbeat, was selected by the Emirate’s Roads and Transport Commission to promote Dubai’s Award for Sustainable Transport (DAST). Entries for the award, which typically highlight environmental protection, mobility management and transportation safety, are due October 1, 2012. Tags: bus rapid transit (BRT), Chicago, Dubai, Ecobici, Israel, Los Angeles, metro, Mexico, Mexico City, North America, San Francisco, SFMTA, TRB, United States, Washington, D.C.